RMI supports method calls to remote objects. When the parameter is passed to a method the JVM makes a copy of the value places the copy on the stack and then executes the method. a) When a primitive data type is passed as a parameter to a remote method, the RMI system passes it by value. b) RMI will make a copy of a primitive data type and send it to the remote method. If a method returns a primitive data type, it is also returned to the calling JVM by value. c) Values are passed between JVMs in a standard, machine-independent format. d) This allows JVMs running on different platforms to communicate with each other reliably. a) When an object is passed to a remote method, the semantics change from the case of the single JVM. b) RMI sends the object itself, not its reference, between JVMs. 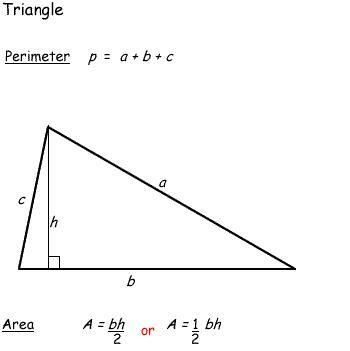 c) It is the object that is passed by value, not the reference to the object. d) Similarly, when a remote method returns an object, a copy of the whole object is returned to the calling program. 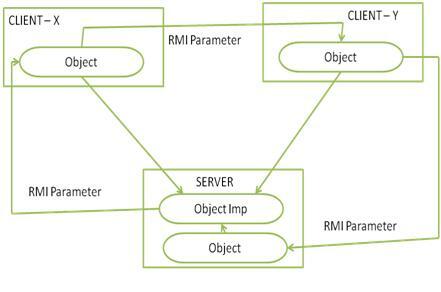 e) Because different JVMs do not share heap memory, RMI must send the referenced object and all objects it references. f) RMI uses a technology called Object Serialization to transform an object into a linear format that can then be sent over the network wire. 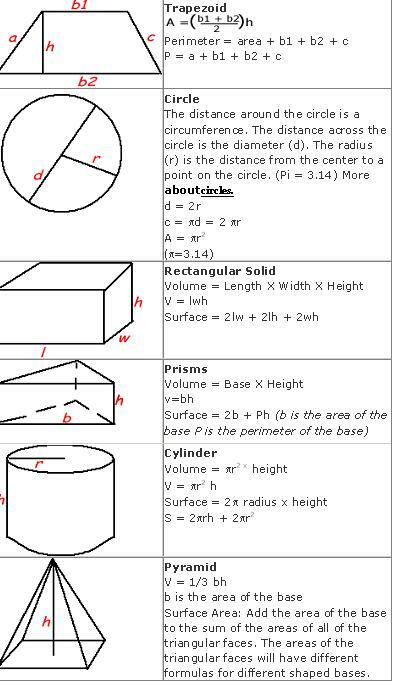 g) Object serialization essentially flattens an object and any objects it references. h) Serialized objects can be de-serialized in the memory of the remote JVM and made ready for use by a Java program. 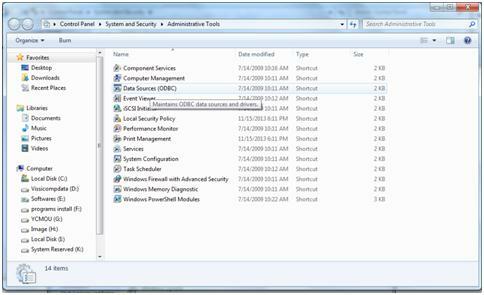 a) A client program can obtain a remote reference to a remote object, through the RMI registry program. b) When a method returns a local reference to an exported remote object, RMI does not return that object. c) It substitutes another object (remote proxy for that service), in the return stream. 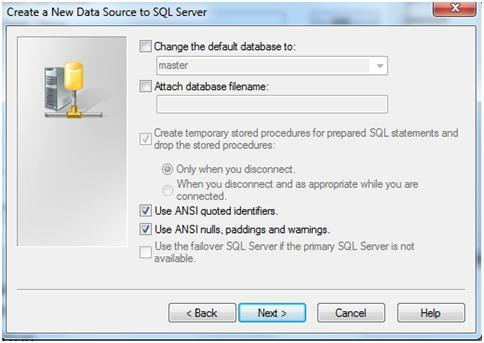 d) When a reference is returned to the server, it is not converted into a local reference. 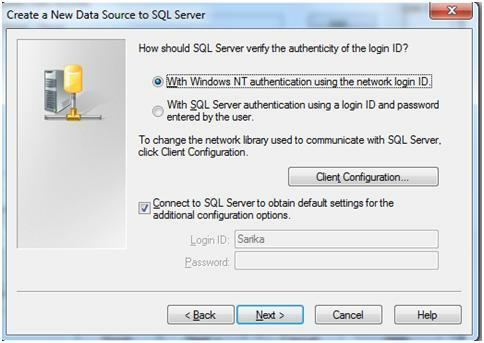 e) When the object from the server is returned, to the client the proxy object is substituted. This entry was posted in Advance Java and tagged Parameters in RMI, RMI (Remote Method Invocation). 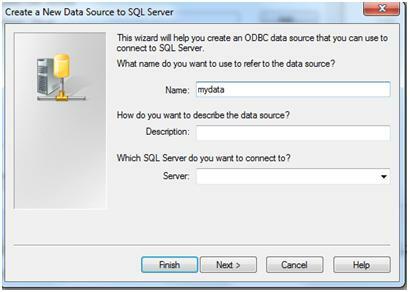 Click on Start button , Select Control Panel, point to Administrative Tools, and then double-click Data Sources (ODBC). 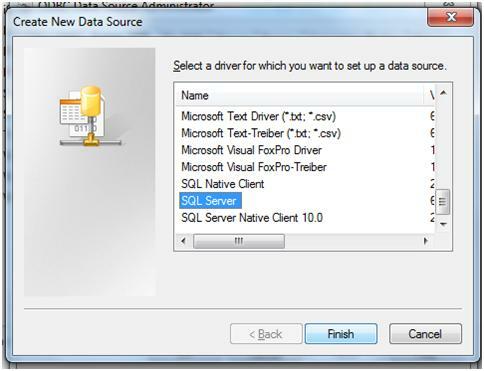 Click the database driver that corresponds with the database type to which you are connecting, and then click Finish. Type the data source name. Make sure to you a name that you will remember. You will need to use this name later. Select server name from server dropdown list. This entry was posted in Advance Java and tagged Java Database Connectivity. Firewalls are inevitably encountered in any network, that has to operate beyond the sheltering confines of an Intranet. They block all the network traffic with certain exceptions defined in the rule-set. 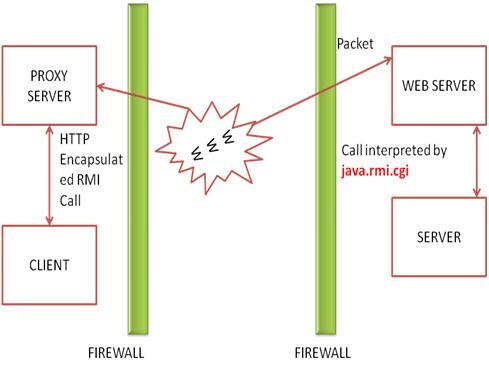 Since RMI opens a dynamic socket connection, between client and server to facilitate communication, the JRMP traffic is blocked by most protocols. On top of TCP/IP RMI uses a wire level protocol – Java Remote Method Protocol (JRMP). 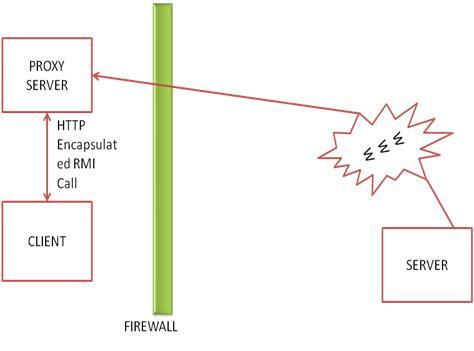 To get across a firewall, RMI makes use of HTTP tunneling by encapsulating RMI calls, within an HTTP post. In the above scenario, when the transport layer tries to establish a connection with the server, it is blocked by the firewall. If a client is behind a firewall, it is important that you also set the system property http.proxyHost appropriately. Since almost all firewalls recognize the HTTP protocol, the specified proxy server should be able to forward the call directly to the port on which the remote server is listening on the outside. Once the HTTP-encapsulated JRMP data is received at the server, it is automatically decoded and dispatched by the RMI transport layer. The reply is then sent back to client as HTTP-encapsulated data. This causes the execution of the CGI script, java-rmi.cgi, which in turn invokes a local JVM, unbundles the HTTP packet, and forwards the call to the server process on the designated port. RMI JRMP-based replies from the server are sent back as HTTP REPLY packets to the originating client port where RMI again unbundles the information and sends it to the appropriate RMI stub. Of course, for this to work, the java-rmi.cgi script, which is included within the standard JDK 1.1 or Java 2 platform distribution, must be preconfigured with the path of the Java interpreter and located within the web server’s cgi-bin directory. 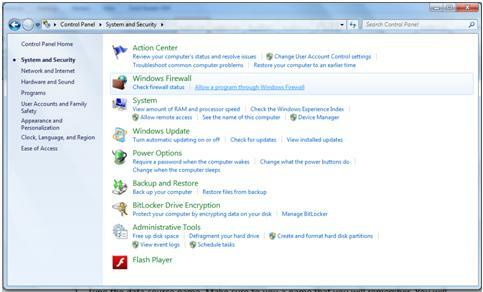 This entry was posted in Advance Java and tagged Firewall Issue in RMI, RMI (Remote Method Invocation). Embedded Systems are becoming more and more pervasive, touching virtually all aspects of daily life. From mobile phones to automobiles, industrial equipment, to high end medical devices, home appliances etc. Embedded software today sits at the intersection of all the technologies. The growth of different industry sectors like automotive, telecommunications, aerospace, energy, industrial units, biomedical equipment, consumer goods is highly contributed by the development in the field of Embedded Systems. According to a survey by Frost and Sullivan, an analyst firm, the embedded systems opportunity is expected to touch $360 billion ( in terms of the devices) and $36 billion in terms of the semiconductors by 2015. Another survey by NASSCOM and McKinsey predicts that the jobs in embedded space will increase ten-fold from the current 60,000 professionals to over 6 lakh people by 2015. Companies like TCS, Wipro, L&T, TATA Elexsi, Infosys, Zensar, Tech Mahindra, Patni, VOLVO, NIIT Tech, KPIT Cummins, Airbus etc. are investing heavily in their embedded systems operations in India. With that expectation, in the near future embedded computing will overtake traditional computing and that there may be more engineers working on embedded systems and related services , then on traditional IT. Experts say what IT was in 90’s is where embedded systems stands now and is ready to explode. The future is bright for India with it being pegged to be the next embedded systems hub in the world. A recent study by NASSCOM talks about the Indian Embedded Ecosystem. This ecosystem consists of all the stakeholders in embedded domain namely, the education institutions, end user industries and entrepreneurial organizations. NASSCOM suggests that there is a need to nurture this ecosystem that would catalyze innovation in the Indian embedded industry. This entry was posted in Embedded systems and technologies and tagged Career in Embedded System. Increased use of multi-core processor platforms: Traditional embedded systems design principles ensured processor and design simplicity in order to meet the stringent needs of cost, reliability, thermal performance, etc. So the use of multi-core processors was not very common. Of late new process and power conservation technologies are driving the use of multi-core processors in embedded system design without impacting the traditional principles. Enhancements in processor design is looking not only at the increased clock speed, but considers increased efficiency, lower power consumptions and integrated graphic performance. 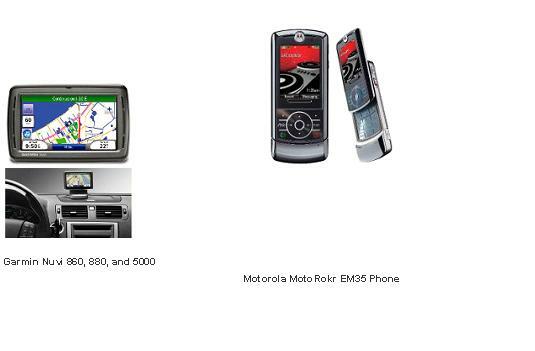 The convergence of devices features and technologies are happening faster than anyone’s imagination these days and the need for connectivity is driving the device designs. All this is adding a security nightmare to preserve personal and professional information from hostile attacks. The embedded system components (processor, operating system, applications) need to have better security features in them in order to tackle these challenges. The enhanced processing power in the devices are driving the need to have better video processing for personal and professional data transfers and there is an increasing trend in devices that have video capability being designed. Innovative application use cases are built in to take advantage of the social networking and other converged platforms to share video across devices. Irrespective of the global economic turbulence, there would be continued investments in providing more innovative and efficient solutions coming up in the embedded domain to cater to these trends. In order to be a winner in the embedded market, the companies and individuals need to constantly develop and innovate on new ideas, approaches that can provide efficient, fast, low power, cost effective solutions to the consumers. The above trends of increased video data, security needs and use of complex processors would demand a new level of expertise in providing these solutions. 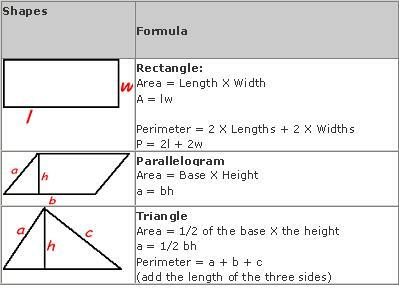 This entry was posted in Embedded systems and technologies and tagged Embedded system.